A great “thank you” to Dorothy Matsui of Redmond, WA, for finding us and sending us material from her grandfather, Harry Raymond. 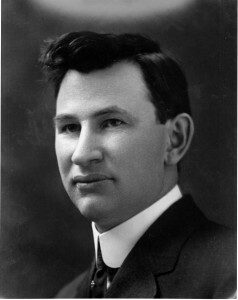 Raymond was an astronomer for Dudley from 1905 until 1939, meaning his career spans the creation of the General Catalog. Raymond’s memoirs will hopefully fill in some of the gaps in our understanding of this period. Harry was a Harvard graduate who was brought in to help with the Carnegie funded cataloging of stars, something that ended up becoming his career. In 1926 he and fellow Dudley astronomer Ralph E. Wilson won the Gold Medal of the Royal Danish Academy of Sciences for determining the proper motion of the sun. The Royal Academy had issued a challenge in 1923, pointing out an unresolved conflict between the apparent motions of stars directly in the sun’s path and the stars at right angles to the sun. This conflict made it impossible to determine the exact speed on our sun’s motion through the galaxy, which was a vital number for much of the astronomical work being done at the time. Using Dudley’s highly accurate measurements of stellar motions, Raymond and Wilson were able to make the conflict go away. During his time at Dudley, Raymond courted and married Adelaide “Addie” Pearl Sweet. Included with his memoir was some of their correspondence, which mysteriously don’t talk about astronomy much. In a previous post, I mention the “professionalization of science,” a cultural shift in which Dudley had a part to play. It immediately raises the question, what exactly does “un-professional science” look like? What came before? We actually have a good example here in the Capitol Region. Most readers will know of the Albany Institute of History and Art, the museum and cultural center a few blocks from the capitol. What many don’t know is that the museum has over 200 years of history. It began, not as a museum at all, but as a society for gentleman farmers. 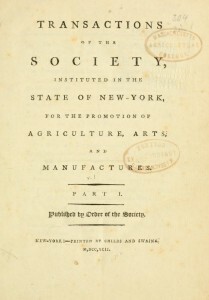 It began in 1791 as the Society for the Promotion of Agriculture, Arts, and Manufactures, with the unfortunate acronym of SPAAM. It was organized by Chancellor Robert Livingston, owner of Clermont and large amounts of the Catskills, and included a number of big names from New York: Simeon Dewitt, the Surveyor General of New York State, and Ezra L’Hommedieu, a large landowner on Long Island. Later on, names like “DeWitt Clinton” and “Stephen van Rensselaer III” were added. Along with meeting and events, SPAAM collected papers of interest and published them in their “Transactions …” Reading through gives us a good feel for what “unprofessional” science was like. Probably the main thing worth noting is who was doing the science. Most of the names were wealthy people who had the time to experiment. Most of their work was tied to agriculture, so it also required a fair amount of land to experiment. Science was not their job; science was an acceptable hobby for gentlemen of leisure with enough land to commit to something unprofitable. More than acceptable, it was actually a way for the American elite to signal that they didn’t have to work for a living. Like the Dowager Countess’ line in Downton Abbey, “What is a week-end?”, it was a way to show off you wealth and status without ostentation. 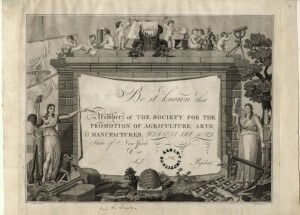 Many people wanted to get science out of the hands of these amateur gentleman farmers and into the hands of trained professionals. Of course, “trained professional” was a little sketchy. Since America had no universities that offered higher degrees in science until the late 19th century, the diploma couldn’t be used as a standard. And of course, someone had to pay these professionals. That frequently meant convincing wealthy people that donating money to build an institution was the real path to status. This was particularly true in astronomy, where building large observatories and stocking them with expensive telescopes frequently required an extremely wealthy patron. It was a slow process of building up institutions to train the professionals, building up the networks to employ the professionals and convincing everyone that professionals were the ones you wanted doing science. Here in Albany, the AIHA and Dudley represent two interesting examples of the early stages of this process. If you were to list the great astronomers of the last century, just based on your own memory, it’s a safe bet that Vesto Slipher would not be a name you come up with. Vesto Melvin Slipher, “V.M.” to most folks, was the head astronomer at Lowell Observatory for over fifty years. If he is forgotten, it’s because he worked at it. Slipher was a quiet, unassuming and humble man. He’s also forgotten because his boss, Percival Lowell, was none of those things. One of the revolutions that Slipher contributed to was the understanding that many of the little blobs of light in the night sky called nebula were actually other galaxies like our own Milky Way. The debate over the nature of these nebula ran from the mid-18th century until the 1920s, and suggestions included stars in the process of forming, clouds of gas and finally other galaxies. This last suggestion, called the “island universe” theory, was finally settled by Edwin Hubble, but a great deal of work went into the theory before that point. 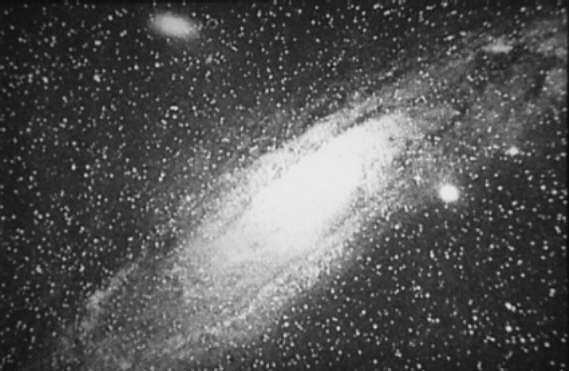 In 1910, prompted by Lowell, Slipher began to take spectrographic readings of the Andromeda nebula. Even though this is the brightest nebula in the northern sky, it was still an arduous process, requiring that a photographic plate be left in place for many hours to capture sufficient light. Slipher spent the next two years rebuilding his spectrograph to capture more light until he finally got a workable spectrum in September of 1912. When he looked at the spectrum – so small that it required a microscope to examine – he got a shock. By looking at how much the spectral lines had shifted, an astronomer could tell how fast an object was moving either towards or away from the earth. This variable is called the “radial velocity.” The radial velocity of Andromeda showed it to be headed towards us at an incredible rate of speed. After taking several more photographs, Slipher calculated that Andromeda was moving at 300 kilometers per second, about ten times faster than the average star in our galaxy. This find changed the debate over the nature of nebula; something moving that fast was unlikely to be part of our galaxy and didn’t fit the understanding of forming stars. Slipher, true to his nature, did not publish his discovery in a major scientific journal, or even in a journal at all. Instead it appeared in the Lowell’s own newsletter, the Lowell Observatory Bulletin. In nine sparse paragraphs, covering both of the two pages of the newsletter, Slipher laid out his process and findings. He suggested that “it might not be fruitless” to look at other spiral nebula. It wasn’t. 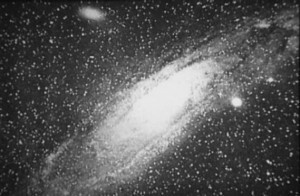 In 1914, with fourteen spiral nebula spectra in hand, Slipher had found that Andromeda was a relative slowpoke; one nebula was moving away from us at 1,100 kps, the fastest celestial object recorded at the time. 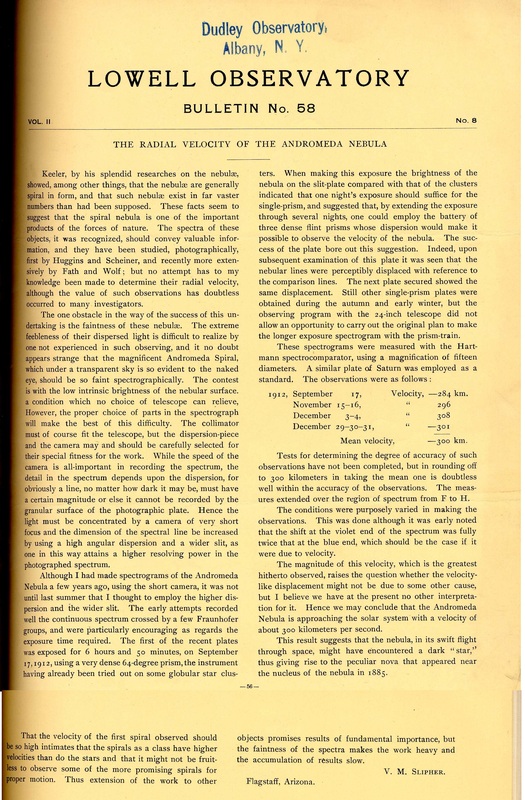 That year, Slipher presented before the Astronomical and Astrophysical Society of America (which changed its name to the American Astronomical Society at that meeting). He received the first standing ovation in the institution’s history. In the audience was a recently elected member, a Wisconsin graduate student named Edwin Hubble. Because he shunned the spotlight, Slipher rarely published or presented papers. 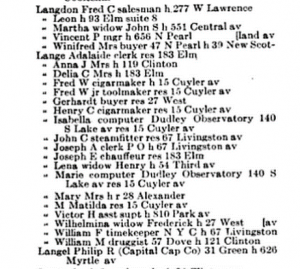 Most of his output went out in the tiny Lowell Observatory Bulletin, which was not collected by many institutions. It’s a very fortunate thing that the Dudley Observatory was one that did. There are few revolutions that can compete in scope with the realization that our galaxy is only one of billions. And this short little paper was a vital part of the process. As a museum worker, it’s always nice to have things in your collection that are a little unconventional. Books and artworks are great, but there’s something fun about having a few taxidermied animals and Victorian hair catchers. 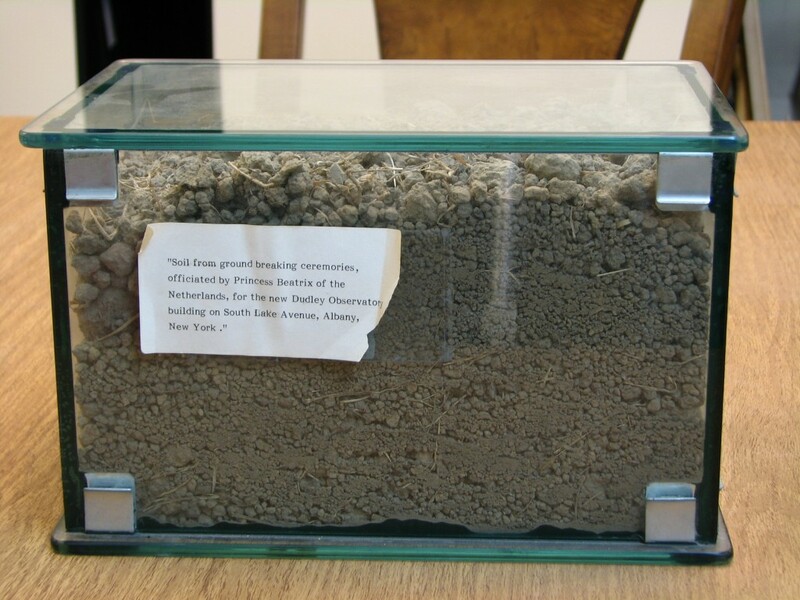 Still, even I’m stymied when I see a glass box full of dirt. 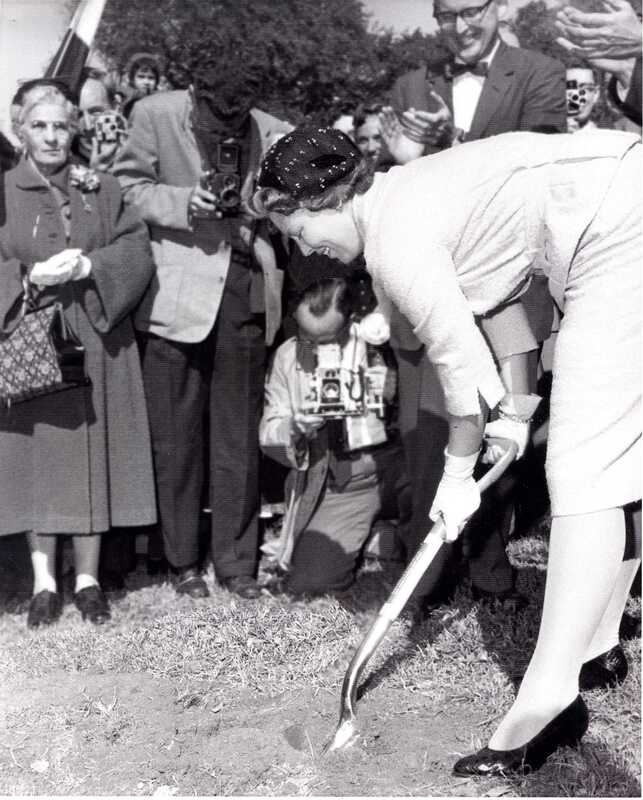 This mix of greyish soil and dried grass is the result of a shovel-full lifted by Beatrix Wilhelmina Armgard, Princess of the Netherlands, during the ground breaking ceremony for the Hudson-Champlain Planetarium on September 19th, 1959. At the time, Princess Beatrice was the heir presumptive on a formal visit to the former colony of the New Netherlands, Albany, New York. The planetarium was to be located near the Dudley Observatory’s South Lake observatory, which means this dirt came from what is now the grounds of Albany Med. The event was the primary photo opportunity for the Princess’ visit, and it was attended by Mayor Corning, Governor Rockefeller, various state commissioners, various local religious dignitaries, Dr. Benjamin Boss and Dr. Curtis Hemenway of Dudley, and young Miss Laura Terlaak-Poot, a Dutch immigrant who presented the Princess with flowers. From here on, it gets a little embarrassing. The capital campaign to build the planetarium stalled, and the planetarium was never built. By the next year, the observatory and the grounds had been sold to Albany Med. Plans to merge the observatory and the planetarium with SUNY Albany fell through. The observatory building burned in 1970. According to legend, the visit by Princess Beatrix, and the shabby look of Albany at the time, embarrassed Governor Rockefeller enough that he made plans to rebuild the capitol area. This led to the construction of the Empire State Plaza. Eventually the planetarium was installed in the Albany Heritage Area Visitor’s Center as the Henry Hudson Planetarium, no longer tied to Dudley. Ironically, after sixty years, the Observatory now shares a building and a close relationship with the Suits-Bueche Planetarium here at miSci. It’s an unfortunate fact that the Dudley Observatory, no matter what it has accomplished and no matter what it may accomplish, will always best be known to historians for its near collapse just as it got started. The simple version of the story is that a split occurred on the board not long after Dudley was founded. On one side was the Scientific Council, made up of the scientific advisers along with the first director, Benjamin Gould, and his patron Alexander Dallas Bache. On the other side were the Trustees, the financial backers like Thomas Olcott and Dr. James Armsby. 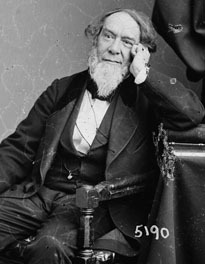 The two sides argued, in person, in the press, in the backrooms and in the courtroom, until Gould was forced to leave. People all over the nation followed the arguments, and still today the fight is studied by historians of American science. Figuring out what the argument was about takes some work. Anyone familiar with board fights, or internet arguments, can probably guess the arc: everyone started out as friends with a polite disagreement, and by the end everyone else was the antichrist. Both sides had long and well-practiced lists of complaints about the other. Reading between the lines of those lists, it looks like the Scientific Council and the Trustees had different visions of what Dudley would be. The Council wanted a top notch scientific institution that would do serious science and nothing else. The Trustees, representing the people who put forth the money, wanted an observatory that would serve the Capitol Region, both by doing useful science and by adding luster to the city’s reputation. These goals were not incompatible at first. But in 1857, while the observatory was still incomplete, a financial crisis made money tight. That meant one side or another would not get their vision of the observatory. The Scientific Council thought that the observatory should be shut down until sufficient money was raised to run it properly; better to let it sit unused than do poor quality work. The Trustees wanted the observatory to start work with whatever equipment it had, to serve the public that had footed the bill to construct it. The details of the arguments that followed would fill a book (specifically, that book is Elites in Conflict: the antebellum clash over the Dudley Observatory by Mary Ann James). All of that is something to cover at another time. For this post, it’s probably best to ask: why should anyone care? With the exception of us poor souls who are paid to care, why should this interest anyone? American science was in a transition that would take it out of the hands of gentleman hobbyists in the early part of the 19th century and leave it with professional scientists by the end. This process, called the “professionalization of science,” turned science into a job, created familiar scientific institutions and granted scientists the social authority they have today. At the center of this process was Alexander Dallas Bache. Great-grandson of the ultimate gentleman scientist, Benjamin Franklin, Bache nevertheless worked towards a vision of science that would make his ancestor’s career impossible. Some historians say that Bache did for American science what FDR did for American government: reorganize it on a much grander scale. 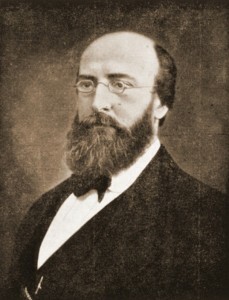 Bache was well connected, shrewd and (usually) diplomatic, and he was firmly in support of his ally Benjamin Gould and a Dudley Observatory run along professional lines. And he failed. It’s one of the few times he did so, which is part of why it’s so interesting. The Battle of the Board sits right in the middle of several of the major disputes of professionalization: how to pay for the new science? How to organize a scientific institution? Who should be in charge? By following the arguments we can get a sense of what forces were at work in this large and important transition. Our high flying outreach astronomer Dr. Valerie Rapson recently gave a Tedx Talk in Albany about the need for continuing education in the STEM fields, the ways in which we can keep adults involved in lifelong scientific learning and why bacon isn’t going to kill you. The night sky has always been a source of inspiration for art that borders on science (or maybe the other way around). Examples are as ancient as the Dunhuang Star Chart, from the Tang Dynsaty in China (618–907), and the Farnese Atlas from the 2nd century BCE. During the 17th and 18th centuries, scientists and illustrators in Europe brought forth their own contributions by creating gorgeous illustrated atlases of the night sky. One of the most famous examples comes from Johann Gabriel Doppelmayr (1677-1750), a German mathematician and cartographer. Doppelmayer’s Atlas novus coelesti, published in 1742, is a fantastic example of the genre. In it, Doppelmayer goes beyond depicting the star field and the constellations, he compiles the best astronomical knowledge available in his time into one book. It’s an awkward size for digitizing, but here’s a good photograph of the central plate. Historian Nick Kanas notes, “In a sense, this beautiful plate depicts the state of astronomical knowledge in the early 1700s.” It’s a remarkable work of art in its own right, but it is also packed with information. At the top left is a scale drawing of the planets relative to the sun. Beneath that is a diagram of a solar eclipse that occurred on May 12, 1706, depicting that shadow of the moon being cast on a tiny map of the earth’s surface. 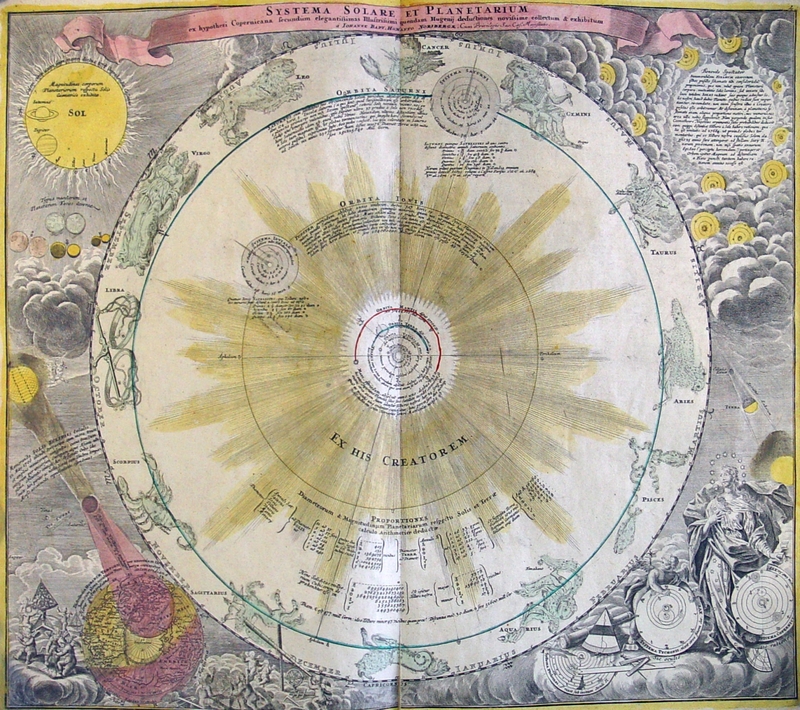 The bottom right shows the three major theories of the solar system: the Ptolemaic geocentric model on the left (partially obscured by scientific instruments in a not-so-subtle jab), the hybrid system invented by Tycho Brache (now mostly forgotten) in the middle and the Copernican heliocentric model on the right. The Copernican model is labeled “sic ratione” or “according to reason,” making Dopplemayer’s verdict on the theories clear. Of course, Copernicus’ model takes pride of place in the center of the work. Depicted are the known planets and their moons, and the zodiac taking up the outer edge. Included is text with dimensions and distances for the planets. The largest text on the page, after the title, reads “Ex His Creatorem,” or “From This [We See] the Creator”. This is just one of the plates in the text, and Atlas novus coelesti is a crown jewel in our rare book collection. We are indebted to Union College Special Collections for housing this and all our other rare books, which are simply too old and fragile to sit next to the old GE refrigerators in miSci’s collection storage. Few pieces in our collection have traveled as far as this one, or seen quite so much. This is the S-10 Particle Collector, from the Gemini space program. How Dudley went from building observatories and looking through telescopes to building particle collectors and looking through electron microscopes is a story that deserves its own post. Suffice it to say that under Director Curtis Hemenway, Dudley hitched its wagon to NASA and the space race, then started creating things like this collector. The S-10 was a micrometeoroid collector, meaning that it was intended to capture very small meteoroids in the very upper edges of the earth’s atmosphere. The device would be launched into space. At a certain point an astronaut would open it like a book – you can see the hinge in the middle – and the various surfaces inside would be open to whatever chose to bombard them. 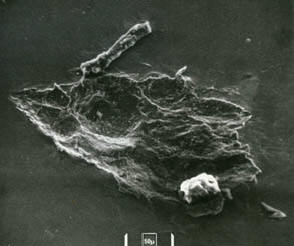 After a time it would be closed, prevented any terrestrial particles from getting inside when it was returned to earth. The goal was to catch very small particles, sometimes called “space dust”. In this case, the S-10 collector was attached to an Agena Target Vehicle (ATV), an unmanned spacecraft launched as part of the Gemini space program. 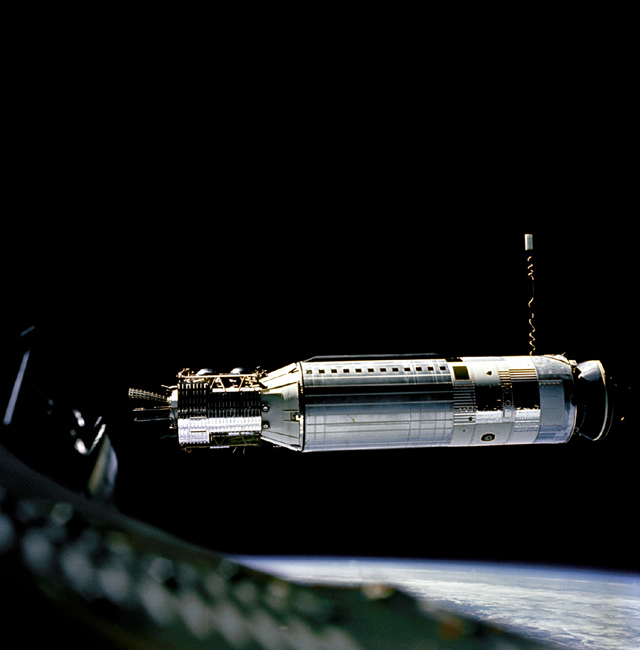 The ATV provided a number of different services for the Gemini capsule, such as help with maneuvering, acting as something to dock with and providing a platform for devices like the S-10. The Gemini program was doing something that no one had imagined doing just decades before, so there’s little surprise that it was beset by problem. The Dudley’s micrometeorite program didn’t escape those problems. This S-10 was mounted on the ATV for mission Gemini 8. When the Gemini capsule docked with the ATV, pilots Neil Armstrong and David Scott noticed that the combined crafts were entering an uncontrolled spin. After disengaging and trying to correct, the Gemini 8 capsule was forced to return to earth far sooner than expected. Gemini 9 had an ATV of its own with a particle collector. But the shroud that protected the ATV during launch failed to detach, so the collector was never recovered. Gemini 10 managed to retrieve the S-10 collector from the Gemini 8 ATV. Pilot Michael Collins successfully left the capsule and performed an Extravehicular activity (EVA) which took him to the Gemini 8 ATV, becoming the first person to travel from vehicle to vehicle in space. Gemini 12 also had an S-10, but it was left on the ATV to record the results of long exposure and never retrieved. This S-10 may be the only one that made it back to earth. It is now on display in the museum’s gallery, in a case to the left of the door to the Suits-Bueche Planetarium, along with a number of other devices for collecting and retrieving space dust created by the Dudley Observatory. Dudley Observatory has spent most of its 160 years as a working science institution, and not a museum. That means that its employees weren’t always focused on saving the kind of materials that a museum would preserve. Of course, they saved the astronomical materials they were working with, but not always the bits and pieces of their own history that would be so interesting today. Which explains why we have so little about the staff of Dudley itself. 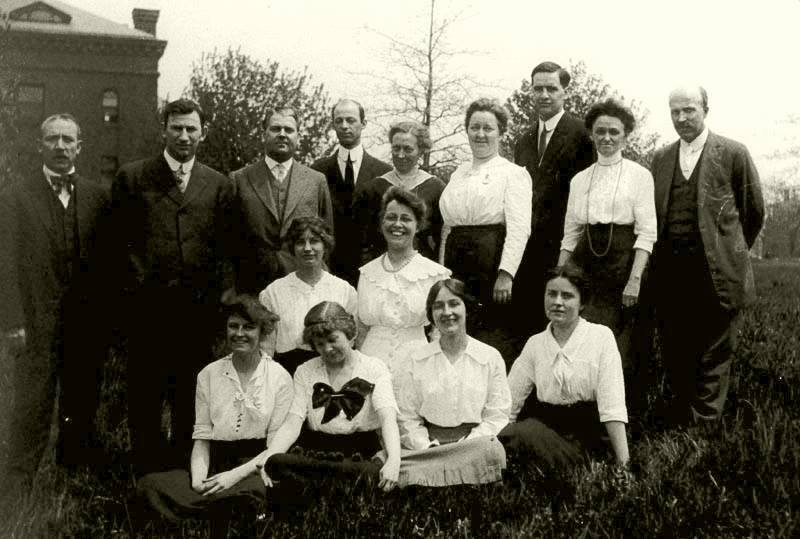 Even from Dudley’s height, about 1905-1935, there are only two staff photographs. One of which survives only because it was used as a bookmark. One thing you’ll notice: out of the fifteen people here, nine of them are women. Since Dudley is usually associated with male astronomers – like Benjamin Gould or the Boss family – what are these women doing here? They were doing what women had done in the field of astronomy since Caroline Herschel became the first female professional astronomer in the 18th century: mathematics. The Dudley was focused on creating a star catalog, which meant recording the exact positions of stars in the night sky. Fixing these positions required massive amounts of computation. Observations had to be run through a tricky statistical equation in order to get the most accurate possible result. At the time, the people who did this kind of work were called “computers”, and for a variety of reasons we can get into later, they were frequently women. The director of Dudley, Lewis Boss, started the process, and when he died in 1912, his son Benjamin Boss took over. Their ambition was to create the largest and most accurate catalog of its time. It would ultimately include over 30,000 stars. This required so many computers that little Dudley Observatory in the sleepy town of Albany became the largest employer of women in American astronomy during the period that that catalog was in the works. In total, they employed 81 women during this period between 1900 – 1940. 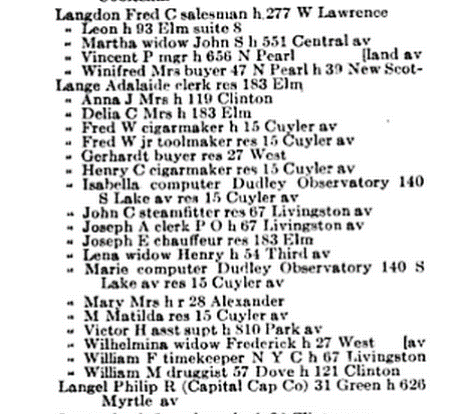 In other times and places, women computers in astronomy would go on to become notable astronomers. Alas, not at Dudley, where the limited scope of work and limited resources didn’t allow women to branch out. Just as frustratingly – at least for us – Dudley didn’t collect any personal material from these women. I can tell you who was on Benjamin Boss’ Christmas card list, but not what Isabella Lange thought of her career in astronomy. So, a personal appeal: if you happen to know anything about the women in the photograph above, or any other of Dudley’s female computers, please drop us a line at: counting.stars@dudleyobservatory.org . … gosh, there are a lot of them, aren’t there? Welcome to Counting Stars, a repository for writings on the history of and around the Dudley Observatory. Those of you joining us from Facebook or All Over Albany may be unfamiliar with the Dudley Observatory. Here’s a nutshell version: Dudley is an observatory founded in the 1850s here in the Capital region. It is an independent observatory, and the oldest of its kind in America. While the institution is currently between observatories, it has been housed in two famous buildings in the past and done world class work there. After a century of useful scientific work, the Dudley became a foundation and an educational institution. It continues on in that capacity, serving as the Capital Region’s Astronomy Resource. The current face of the Dudley Observatory is Dr. Valerie Rapson, a Doctor of Astrophysical Sciences and Technology from RIT. By now you’ve probably seen her on the local news explaining the most recent astronomical discovery. My name is Josh Hauck, and I’m the resident librarian and archives rat. The Dudley is currently housed at the Museum of Innovation and Science in Schenectady, NY, and we work closely with the staff here, and in particular with the Suits-Bueche Planetarium. I’m hoping to use this page to highlight the Dudley’s historical collection, which hasn’t been explored much in the past. We are just beginning the process of building a small observatory to house our primary telescope, and hopefully that will be chronicled here. And in general, this page will serve as the clearinghouse for things related to Dudley’s history. Welcome, and I hope you enjoy.